“Peanut” may sound like a plant that can’t quite make up its mind where it belongs in the world of botanical classification. What’s your guess? A nut, you say? Nope, the goober is actually more a pea than a nut. 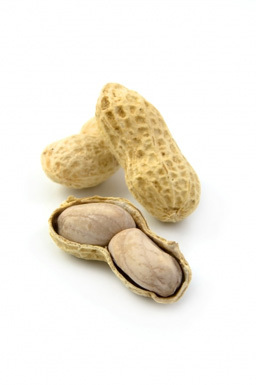 The versatile, tasty morsel we call the peanut is the pod or legume, and not the nut, of the arachis hypogea plant, a member of the same botanical family as the ordinary green pea. But the peanut is an unusual member of the pea family, since its pods have the peculiar habit of ripening underground. After the plant’s flower is pollinated, a stalk-like structure called a peg begins growing from the base of the flower toward the soil. Only when the tip of the peg is below the soil surface do the fertilized ovules begin to develop their characteristic pod. These pods also appear to serve as roots to some extent, absorbing minerals from the surrounding soil. The one to three “nuts” found inside the shell are the seeds of the plant, although the tiny morsel found inside the nut when it’s split open is the only part of the seed with reproductive powers. Most Americans would probably guess that the peanut is a native of Africa, perhaps because of its popular association with African slaves in the Southern United States. True, the goober did cross the ocean with the slaves, but that’s only half the story. The goober was gradually transplanted in West Africa as a food and fodder crop. Subsequently, slave traders found that the peanut could provide cheap, nutritious food for Africans being carried across the ocean on slave ships. Eventually, some African peanuts were brought to Virginia and planted for livestock fodder. Thus the peanut made two transatlantic journeys before becoming a North American crop. Initially, peanuts were most used in Virginia as fodder for pigs, and the soft, juicy ham made from peanut-fattened hogs has ever since been known as Virginia Ham. George Washington Carver is the man most responsible for widespread cultivation of peanuts in the United States. Carver’s work in the early part of this century showed that the peanut could help free the South from its dependence upon cotton, and restore needed nitrogen to soil depleted by cotton cultivation. When Carver began his research in the 1890’s, the goober was not even recognized as a crop; by 1940, the peanut ranked as one of the six leading crops in America, and the largest crop in the southern United States after cotton. Carver, the son of a slave, not only demonstrated the ecological advantages of peanut cultivation, but later found new uses for the crop after it had become over-abundant here as a foodstuff. Carver discovered some 300 derivatives of the goober, including cheese, milk, flour, coffee, ink, dye, plastics, soap, wood stains, linoleum, cosmetics, and medicinal oils. And in his spare time, Carver managed to find over 100 derivatives of the sweet potato! Peanut butter is one peanut derivative we can’t thank Carver for. That great favorite of the schoolboy was introduced by a St. Louis doctor in 1890 for patients who needed an easily digestible form of protein. Thereafter the peanut batter became a fad. Today, about half of the United States’ annual peanut harvest of some 4 billion pounds is used for peanut butter, with the remainder going to salted nuts, candies, oil, and livestock fodder. Only about 10 percent of our crop is used to manufacture peanut oil; but throughout the rest of the peanut-growing world, the goober is grown almost exclusively for its oil. Planters Peanuts, the world’s largest dealer in peanut products, was founded in 1906 by Amedeo Obici, an Italian immigrant who had journeyed alone to America as a twelve-year-old boy. Starting as a peanut vendor in Wilkes-Barre, Pennsylvania, Obici built Planters into a ten million dollar a year business within a quarter-century. “Mr. Peanut,” the company’s trademark, began his association with Planters in 1916, when the firm offered a prize for the best trademark suggestion. A fourteen-year-old Virginia boy submitted a drawing for an animated peanut, another artist added the familiar cane, hat, and monocle, and “Mr. Peanut” was soon appearing plumping Planters peanuts everywhere. The peanut requires at least five months of strong sunshine and twenty-four inches of rain annually, and thus is restricted to the warmer regions of earth. India is the largest peanut-producing nation, followed by China and West Africa, with the United States fourth in total production. As a food, the goober is one of the most concentrated sources of nourishment known to man. Pound for pound, the peanut provides more protein, minerals, and vitamins than beef liver, more fat than heavy cream, and, dieters beware, more calories than sugar. Recent experiments in Africa have shown that the discarded shells of the peanut can also be used as animal fodder! Peanuts may be basically a snack food in the United States, but in many parts of Africa and Asia the goober is an indispensable part of the diet. To demonstrate the importance of the peanut in other nations, we might note that the first American to be honored with a monument in India was none other than George Washington Carver. In 1947, the peanut growers of India unveiled a monument in Bombay to commemorate the American’s outstanding work. Why Did George Washington Carver Find Over 300 Uses For Peanuts and What Products Did He Create From Peanuts? Where Did The Peanut Come From And Who Eats the Most Peanuts? How toxic is aflatoxin a carcinogen that can grow on peanuts?